This week we have had snow and more snow. Everyone is amazed at how much snow we are getting. It is quite unusual. However, being such dry snow, it blows away rather quickly. Last night it snowed all night long and everything was white when I awoke this morning. It was beautiful. And the temperature was only +10°F. I really enjoy the snow here. It is too dry to make snowballs or snowmen or anything, but it's fun nonetheless. The scientists here are nicknamed beekers, and the only street sign in town runs in front of the Crary Lab and is called 'Beeker St.' The beekers I have gotten to know the best are involved in a very exciting project called the Cape Roberts Project. 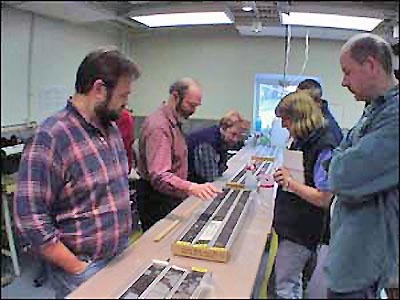 This project's aim is to recover and analyze core samples from the sedimentary strata beneath the sea floor off of Cape Roberts in the Ross Sea. Some of the things they hope to find out are how far back in time ice sheets on the Antarctic continent have been causing changes in global sea level; weather patterns during those times which will help enable future global weather predictions; to date the rifting of the Antarctic continent in order to understand the formation of the Transantarctic mountains and the Ross Sea. Millions of years ago Antarctica was part of a larger land mass called Gondwana, which was made up of what is now South America, Africa, India, Antarctica, and Australia. About 470 million years ago Antarctica was actually near the equator and was covered with plants and animals. We have an abundance of fossil evidence to support this. By 280 million years ago Antarctica had slid southwards and was over the South Pole. A major ice age occurred on all these southern continents. 160 million years ago was a warm period with no polar ice caps. Antarctica had shifted away from the South Pole as a prelude to the break–up of Gondwana. By 70 million years ago Antarctica had moved back close to the South Pole and wide oceans developed between Antarctica and Africa and India. 45 million years ago Antarctica continued to shift towards the South Pole and became surrounded by oceans as Australia headed north. The encircling oceans isolated Antarctica and gradually cooled it. By drilling into the earth the scientists can go back in time to learn about earth's history. However, finding drilling equipment to go deeper and deeper gets more and more difficult and vastly more expensive. Fortunately they have found a place at Cape Roberts where strata are curved in an upward slope because of the formation of the Transantarctic mountains. In other words, the strata recording old glacial and rifting events are at or near the surface. Elsewhere they are quite deeply buried. This allows them to go back further in time, but without having to drill so deeply (relatively speaking of course). 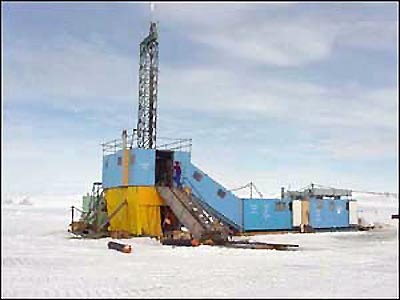 Because this strata is located under the Ross Sea, a drill rig has to be constructed on top of the sea ice. This drill rig weighs 57 tons, and the drilling equipment itself weighs another 9 tons. 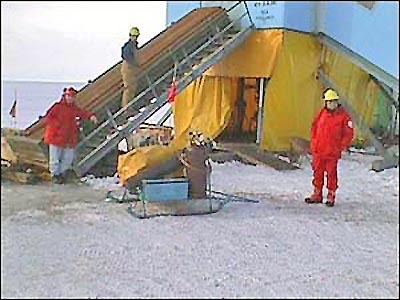 The drill has floats attached to it to help support the weight, and huge balloons are inflated under the sea ice to help support the rig, adding an additional 11 tons of lift. Of course timing is critical. Drilling cannot begin until early spring (October–November) to allow the sea ice to thicken to at least 1.5m to be able to support the rig. This particular sea ice is not part of the permanent ice shelf and will be melting away rather soon, some time in December. 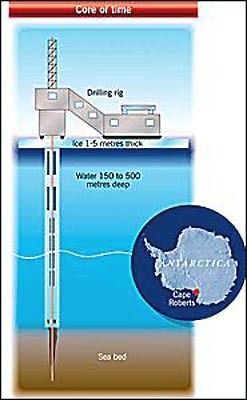 The water beneath the ice ranges from 150 to 400 meters deep. Measurements and adjustments must be made several times a day. A small camp of around 40 support and science people is set up at the drill site and crews work around the clock on 12 hour shifts. 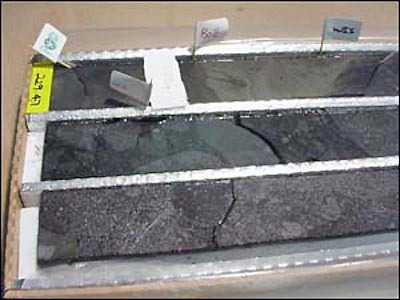 Core is brought to the surface after each 3m of drilling. During the first drilling season they drilled 148m below the sea floor. Diverse shells found at 32 meters below the sea floor and 1.2 million years old indicate conditions for a brief period very different from today. 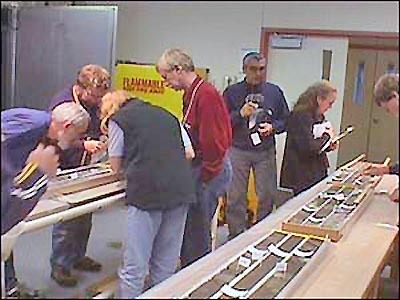 Layers below 43 meters under the sea floor and 17 to 22 million years old indicate a warmer but highly variable style of glaciation and many new microfossil species to help dating in the future. The hope for this season was to drill to a depth of 700 meters below the sea floor. They have had an absolutely exceptional season and have surpassed their goal by going to a depth of 938.42 meters. Everyone is very excited. It is the deepest bedrock hole in Antarctica. 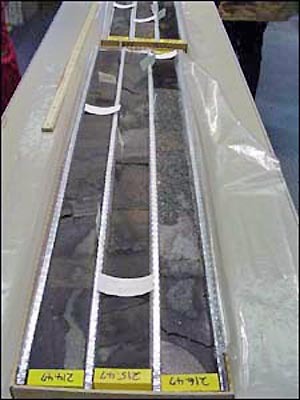 It will be some time before all of the data is analyzed and reports made, but preliminary estimates are that these core samples are around 350 million years old. It is really amazing. 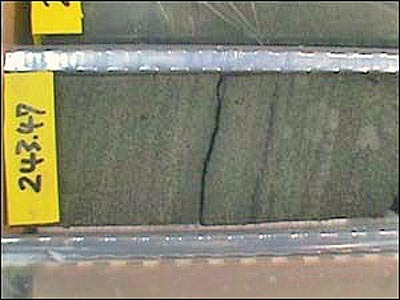 Once the cores are brought to the surface the outside is scanned into the computer, and at the same time a camera inserted into the hole photographs the corresponding section remaining in the earth. Electromagnetic measurements are also made. 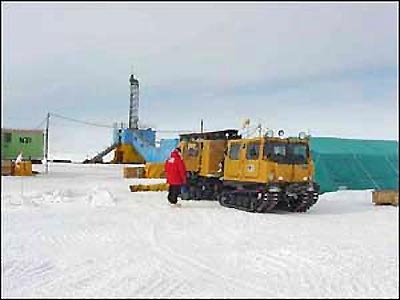 The core is then transported by helicopter from the drill site to the Crary Lab in McMurdo. There it is sliced in half lengthwise. One half will be put into cold storage and saved as an archive. This is stored at Florida State University in Tallahassee. The other half of the core is available to the various scientists. 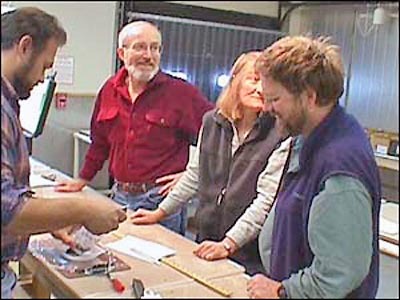 As soon as core is brought into the lab the scientists all gather and select sections they are interested in studying. 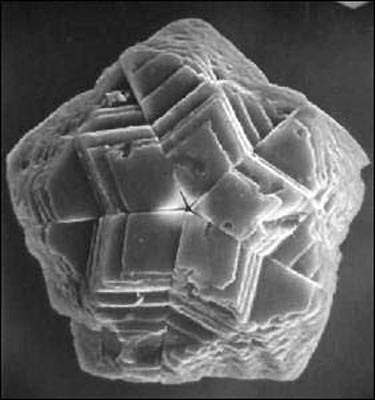 The sections are really quite small, ranging from 1 to 3 cubic centimeters. These are then cut out and set aside for the scientists. 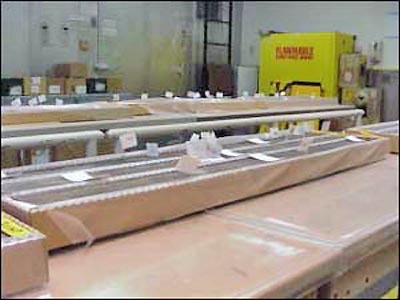 The remaining section of core is put in cold storage in Germany, and is available for the scientists at future times if need be. I have spent a good deal of time in the lab and I have to tell you that seeing some of these fossils and this rock from nearly 1000 meters under the earth that is 350 million years old is awe inspiring for me. I know that you can go out in many mountains and other places and find rocks much older than that, but somehow seeing this rock that has been under the earth for all those millions of years is amazing. The core also has a smell all its own as well. I would not know how to describe it other than earthy. It is nothing I have smelled before and not at all unpleasant. 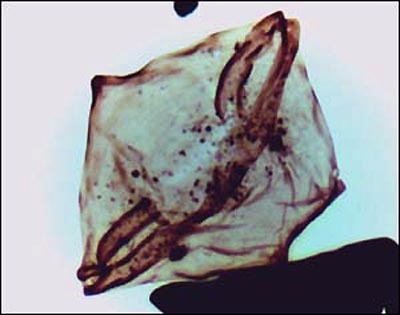 I have also seen many of the fossils they have found. It is a wonderful experience. 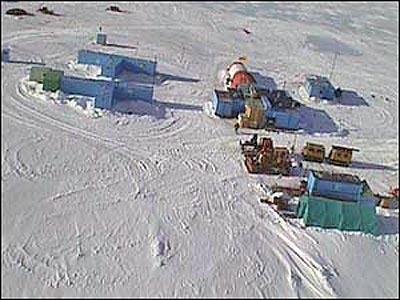 The Cape Roberts Project is a joint venture by scientists and the national Antarctic programs of Australia, Germany, Italy, New Zealand, the United Kingdom and the United States of America. Dr. Peter Webb started this project. He first came to Antarctica as a student in 1957 and has been coming ever since to work on various projects. He is a very interesting and nice man. John Wrenn is a palynologist from Baton Rouge, LA. He studies the fossils in the core and helps to date the core. He and Matt Curren are my good friends and wonderful people. Matt is the assistant curator of the core and lives and works in Tallahassee at Florida State University. Pictured below are some of the fossils they have found. Copyright © Irma Hale. All Rights Reserved. Thanks to Design Computer Systems, Inc.